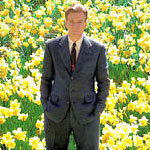 Big Fish is a simple family story about a man and the influential tall tales he tells his young son while growing up. Throw in the artistic finesse of director Tim Burton and the unabashed glee of star Ewan McGregor and Big Fish turns into one of the year’s biggest and best surprises. Probably everybody has heard the far out stories of the average guy who makes the biggest catch of all time while fishing (alone, naturally) on a lazy Sunday afternoon. That would be Ed Bloom. Not only did he use his wedding ring as bait, he also caught that big fish while his wife was giving birth to his son, Will. Make no mistake about it, though. Ed (Ewan McGregor, Moulin Rouge) is a loving, devoted husband and he knew from the moment he spotted Sandra (Alison Lohman, Matchstick Men) at the circus that she was The One. Unfortunately, his giant friend, Karl (Matthew McGrory, House of 1000 Corpses) created pandemonium upon his introduction to the unsuspecting audience and Sandra was lost in the crowd. Having seen his soul mate, Ed labors as everything from human cannonball to lion tamer as he daily scrapes clues about Sandra out of the ring master (Danny DeVito, Batman Returns). As it turns out, that ring master is far more than meets the eye and he ultimately provides Ed with the information he needs to find his true love. Well, wait a minute. That’s one story. Then there’s also the time when Ed served in the army and met the Siamese twins Ping and Jing (Ada Tai and Arlene Tai, Rush Hour). There are also all those high school tales, of being the number one baseball star and football star, the science fair wiz, and the local hero who saves a dog from a burning house. Ed is quite a guy. Unfortunately, Will (Billy Crudup, Almost Famous) has grown disenchanted with his father’s never-ending stories of a life that never happened. In Big Fish director Burton (Edward Scissorhands) has found the ideal vehicle for his wacky cinematic vision. His eye complements the story’s heart and together they create a romantic epic of witches, werewolves, bank robbers, and quiet, sleepy villages. In addition to the fantastic world of Ed Bloom, there’s also the more personal tale of the father and his son. Ed (played as an older man by Albert Finney, Erin Brockovich) is ill and his son, a storyteller in his own right as a reporter for UPI in Paris, has come home to visit and make peace with his father’s past. Putting bits and pieces together, Will learns that not everything his father told him happened exactly as he was told. For instance, when he was born, Dad wasn’t out fishing and grabbing the biggest fish ever seen by mankind. No. Instead, he was in Kansas, selling novelties door to door. But his wife also gave birth to Will earlier than expected. If Dad could have, he would have been home. And so it is, behind every exaggeration, there is something of an honest reckoning. Also coming out of those tall tales are simple truths about life, little bits of wisdom that a child can digest. How did that fish get so big? He got that way because he never got caught. There’s also a very nice detour through Spectre, Alabama, where everybody walks around barefoot and as content as bugs in a rug. There are shortcuts, Ed would learn, but to get and enjoy the real rewards in life, you have to go through some difficulties. Nothing in life comes easy and, as an ambitious go-getter, Ed leaves the fine folk of Spectre behind in pursuit of his big dreams in the big city. Big Fish, based on Daniel Wallace’s novel “of mythic proportions,” is a movie full of ideas that could have gone terribly wrong if it weren’t for a cast that breathes life into this larger-than-life assembly of characters. In particular, McGregor is the only actor around who could imbue the younger Ed Bloom with such over-the-top enthusiasm and 1950s purity and still make it all work. Jessica Lange (Titus) makes a lovely older version of Sandra and together with Finney they do seem like the ultimate happily married couple. They’re a faithful couple, the kind to which only the 1950s gave birth. From a grandiose romance that would make Cupid blush with envy to the high-flying adventure of Ed Bloom at war, Big Fish covers a lot of ground while offering big laughs, big drama, and big soul. The beauty of Big Fish is that, while it covers its medicine in some of the sweetest eye candy around, this allegory holds more human truths than any other Oscar contender. Perhaps the finest, and simplest, of those truths is the message that resonates throughout Big Fish: Life is what you make of it.